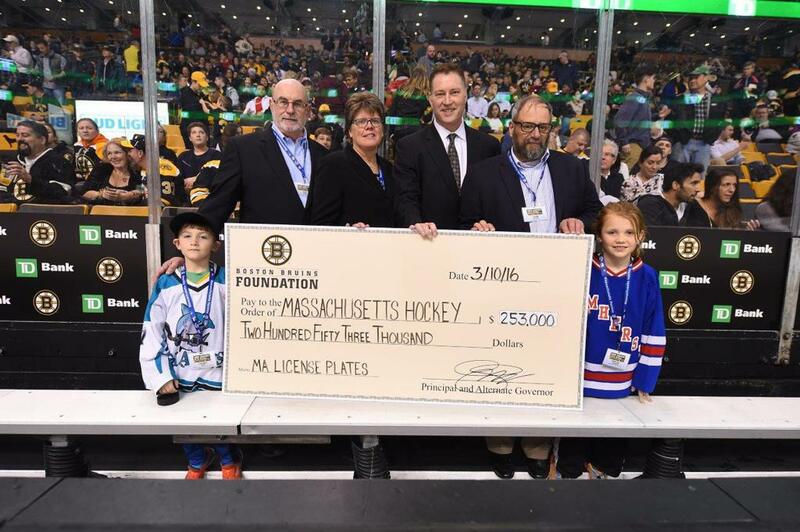 The Boston Bruins Foundation presented a donation of $253,252 to Massachusetts Hockey at the Bruins vs. Hurricanes game on Thursday, March 10. (L to R): Cheever Grant player recipient from Cape Cod Canal Youth Hockey, Massachusetts Hockey President John Tobin, Cheever Grant Chair Ellie Cheever, Boston Bruins Foundation Director of Development Bob Sweeney, Massachusetts Hockey Treasurer Greg Sophis & Cheever Grant player recipient from Amherst Youth Hockey. 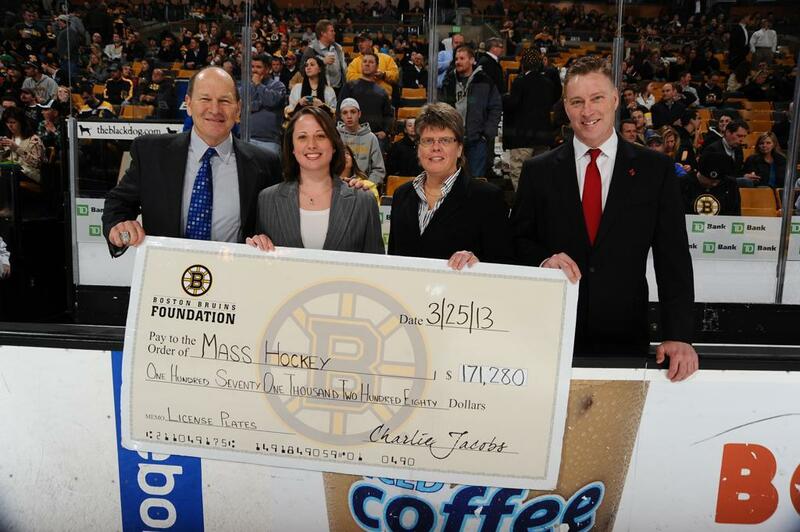 The Boston Bruins Foundation presented a donation of $171,280 to Massachusetts Hockey at the Bruins game on March 25th. (L to R): Boston Bruins Youth Hockey Ambassador Tom Songin, former Massachusetts Hockey President Keri Allen, Cheever Grant Chair Ellie Cheever & Boston Bruins Foundation Director of Development Bob Sweeney. 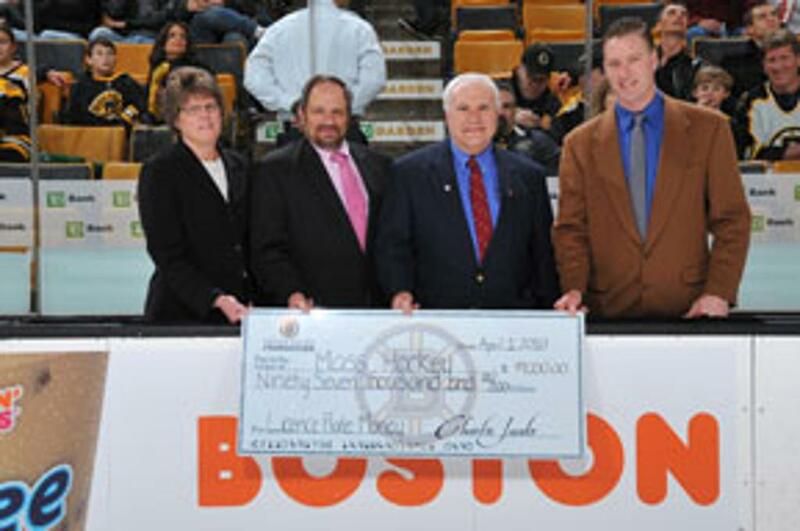 (L to R): The Boston Bruins Foundation presented a donation of $97,000 to Massachusetts Hockey at the Bruins game on April 1. Cheever Grant Chair Ellie Cheever, MH Treasurer Greg Sophis, Former President & Current USA Hockey Registrar Stephen Palmacci & Boston Bruins Foundation Director of Development Bob Sweeney.